7 January 2015, Gent - The decades-old (but very cool!) 3D File System Browser tdfsb has been forked back to life and received new features, improvements, and cleanups. Version 1.0 has just been released under its new name: 3dfsb. Among the new features are tons of additional supported audio and video formats (with GStreamer), better filetype identification (with libmagic), higher resolution textures and a new "lasergun tool" that allows you to zap your files away in the 3D world to delete them! 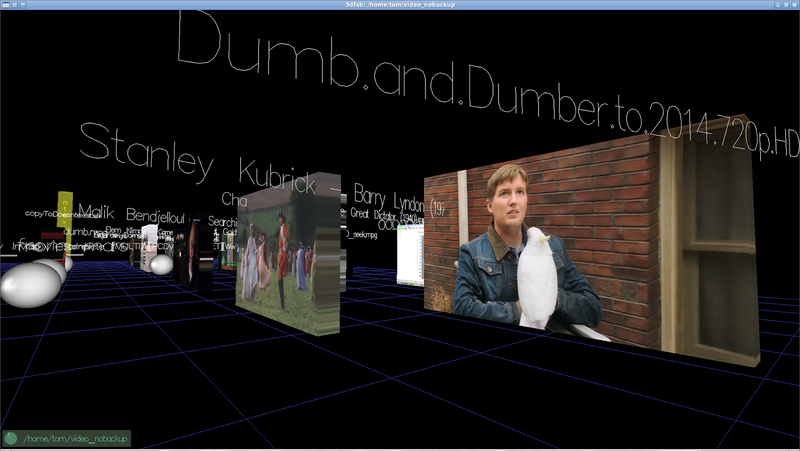 "I've been cleaning up and improving a very old 3D File System Browser. The original version was called tdfsb, and had been dormant for 7-13 years. After trying to get in touch with the original author (Leander Seige) via various channels without reply, I decided it's probably best to fork the original code. Leander was kind enough to release his code under the GPLv2 software license, so no problems there. Thank you, Leander! The new software is called 3D File System Browser, or 3dfsb for brevity. The code was, and still is, fairly rough. It's all in one big .c file and comments were few and far between. That's completely understandable, historically speaking. Although I didn't hear from the original author, I imagine that it started out as some kind of a research/educational project to get to know the various libraries it uses. And that's exactly why I picked it up: to deepen and refresh my GStreamer, OpenGL, SDL and 3D geometry knowledge. Yes, indeed: 3D geometry, of which you need a lot of when rendering 3D worlds! All in all, it's been very educational, and I hope we can keep improving this cool program further. I'm releasing version 1.0 today for your feedback, testing and enjoyment." ou explicitly configure the program to do so. 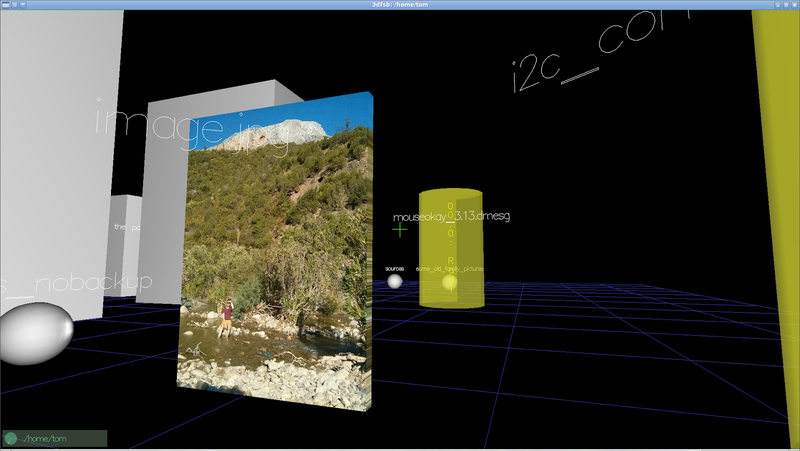 - Video input device (eg: webcam) file previews: Video4Linux (V4L2) capture devices are now visible in the 3D world and can be viewed just like your movies! This version runs at 1920x1080 resolution while playing 720p H264 video (2048x2048 texture) on a single-core of the Intel Core i7 at 2.90Ghz. Above: all major audio and video formats are supported through GStreamer. Video texture size went up from 256x256 to however high your GPU can go. Think 8192x8192. 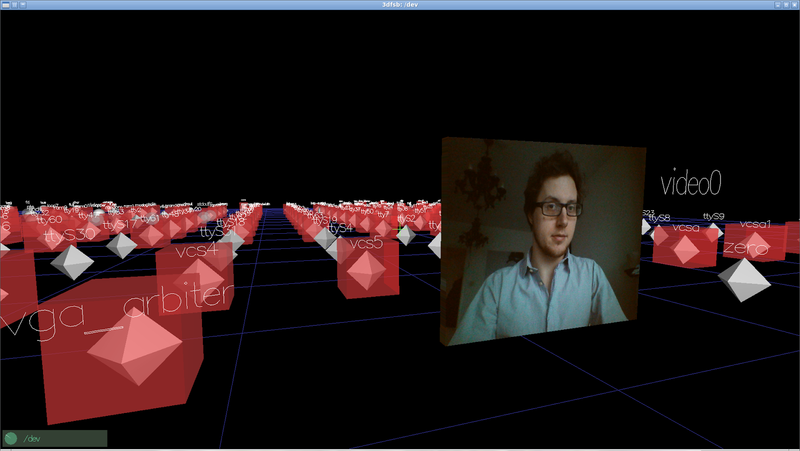 Above: hardware device files (such as webcams) are visible in the 3D world and can be accessed from it. Above: filetype detection is much more robust and versatile, relying on libmagic to identify a filetype by its contents. The old method, which is based on filename extensions, is used as a fallback. Above: you can use different tools to operate on your files, for example: blast them with the laser to delete them! And don't worry: for safety reasons, the program doesn't actually delete them from your disk unless you explicitly configure it to do so. 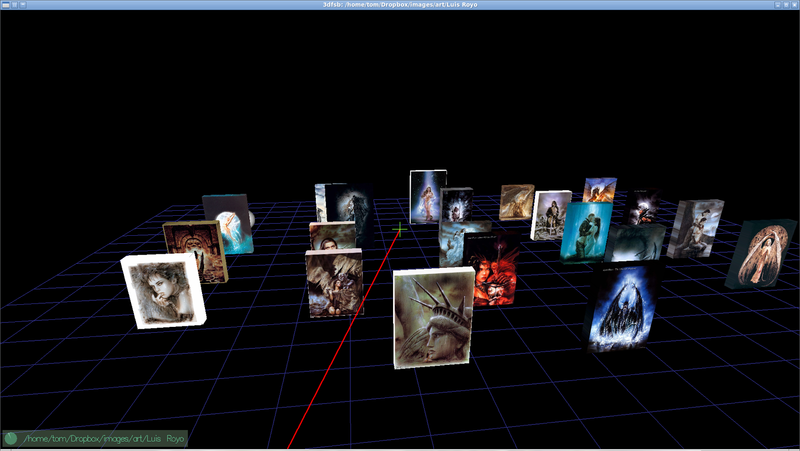 All sources and releases are GPLv2 and published in the 3dfsb repository at GitHub. If you need any help, including (but not limited to) packaging this software, don't hesitate to contact me or drop a line in the comment section.